The "Wiener Stadtbahn" or "Vienna City Railway" was a public mean of transport that was built in 1898 under the supervision of the Art Nouveau or Jugendstil architect Otto Wagner. The term "Stadtbahn" was officially in use until 1989, when the remains of the Stadtbahn were incorporated into the developing subway system of Vienna. Today, many of the Jugendstil stops of the former Stadtbahn - buildings designed by Otto Wagner - are more or less famous landmarks and still in active use for the subway lines U4, U6 or the S-Bahn S45. 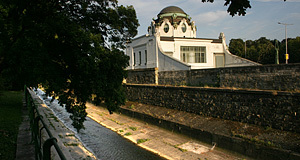 The most famous sections of the former Stadtbahn are the Hofpavillion (the private Stadtbahn stop for the Emperor and his family - see picture above) at Schloss Schönbrunn (U4 stop at Hietzing), the individual stops along the Wiental Valley and the Gürtel and the pavilions at the Karlsplatz Square. The latter ones are not in use anymore. The Stadtbahn was developed in the late 19th century, when major traffic lines were planned to match roads and means of mass transportation with the seemingly ever-increasing population of Vienna. The Danube, the Donaukanal and the Wien Creek were trained - this created new "lifelines" and space for roads and rails. The original Stadtbahn was powered by steam engines and comprised of five individual lines: Hütteldorf - Hacking - Hauptzollamt (today′s Ministry of Finance); Hauptzollamt - Donaukanal - Heiligenstadt; Hütteldorf - Hacking - Heiligenstadt; Hauptzollamt - Praterstern. There were plans for further developments and links between individual lines - and even some actions, as one can still see from foundations for rail tracks and stops at places like the U6 subway stop of Gumpendorferstraße. The Wiener Stadtbahn was opened section by section between 1898 and 1901. Towards the end of WWI, the Stadtbahn (like most of Vienna) ran out of coal and cancelled its operation. After the end of the war and the collapse of the Empire, most parts of the Stadtbahn were let to the City of Vienna and modernised. In 1925, all trains became electric ones and the Stadtbahn was re-opened as "Wiener Elektrische Stadtbahn" (Vienna Electronic City Railway). In 1934, the Stadtbahn was finally sold to the City of Vienna. The next modernisation followed after WWII in the 1950ies, when the electric trains were upgraded with new steel cabins. From 1976, the Stadtbahn stops and rails were gradually incorporated into the developing subway system of Vienna. The stops of subway line U4 were strongly altered to match them with modern safety regulations and accessibility standards. However, they remained coherent with the original Jugendstil style and the entrance buildings (Aufnahmegebäude) were preserved. The stops of the Gürtel line - subway U6 - are more authentic. In both lines, those parts that were contributed by Otto Wagner are widely still in good shape and preserved. The worst destructions happened due to bombs in WWII. Today, the former Stadtbahn can be seen as the origin for one of the most attractive subways in the World - even though it is mostly above ground level and thus, strictly speaking, no real "subway". For a little tour of the former Stadtbahn, I recommend to have a look at the Stadtpark stop with its Jugendstil ornaments between station and park, then continue with the pavilions of Karlsplatz, maybe walk to Kettenbrückengasse for another type of entrance area, go to Hietzing, marvel at the private Hofpavillion stop for the Emperor, return to Längenfeldgasse and go on a ride on U6 along the Gürtel.